EDIT: This post is now outdated. Please see our Sage 200 main page for the latest version information and features. Sage 200cloud now receives multiple updates per year, packed with new features as voted for by the Sage community. The 2018 Spring Update is now available. Don’t worry, you can still run Sage 200 on premise on your own servers in house, this is a marketing re-brand from Sage only to better communicate their cloud position. The core product is the same that you are used to, with added updates and improvements. Only the name has changed. New features include the ability to hide redundant nominal and cash book accounts. Data lists now refresh automatically following user actions such as completing an order or posting an invoice; Previously you had to click the refresh button to update your lists. Quotations can now be converted to Proformas. Reports to assist with GDPR compliance have been added to identify personal information and accounts you have not traded with in some time. The program is Making Tax Digital (MTD) ready and HMRC are running a beta scheme for businesses who are interested in shaping the future of digital VAT submissions in the UK. A list of reported product defects have been resolved and licence renewal reminder messages now appear from 30 days before your renewal, at this point we as your Sage Business Partner can take action, instead of appearing from 60 days as it always had done in the past. Integration with the latest version of Sage CRM 2018 R2 is also now available. 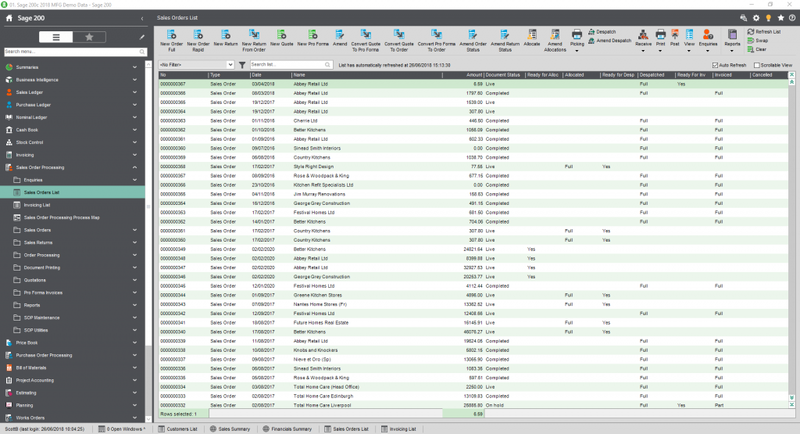 If you’re upgrading from an older version of Sage 200 you’ll also receive all of the new features from the previous seasonal updates such as the new Invoicing module, Rapid Purchase Invoice entry screen, Purchase Requisitions system, Enhanced Transaction Correction abilities without re-posting or manually reversing, Create Returns from Orders, Enhanced Budget Reporting, Bank Feeds, the ability to hide inactive customers and suppliers, Additional SOP Order Statuses and a Sage Contact app for Outlook 365.